Virtual realities have been around for a number of years, but they are still in their infancy. In the past they have been used as simulators and trainers for pilots, the military, police, and doctors. Newer uses include theme rides at the nation's top amusement parks. But they have also long been the area of exploration for artists. They are a place to experiment with visuals, sound, and interactivity. In this type of art, the audience is no longer merely viewing, but is actively participating in the artwork. Without the audience interaction, there is no art. The art is in the interaction. Char Davies has completed two major interactive artworks. Her most recent, Ephémère, is a fully interactive visual and aural virtual artwork. The work uses real-time 3-D computer graphics and interactive 3-D sound. The immersant (no longer merely a viewer as in traditional forms of art) dons a stereoscopic head mounted display and real-time motion tracking, which is based on balance and breath. During the immersive experience, visual and aural elements develop, linger, and then transition out in response to several variables, including pace of movement, length and duration of gaze, passage of time, and more. The piece works on three levels: the landscape, earth, and interior body. It suggests the symbolic relations between body and earth. As a Canadian, the work was inspired by an actual place on the mountain slopes of rural Quebec. This inspiration was evident in the color used in the work. Her use of strong neutrals in an analogous range of warm colors can clearly be seen in Figure 10-9. These hues bring viewers back to the natural world and are evocative of nature. Char Davies, Seeds, from Ephémère, 1998. Additional credits: Custom VR software, John Harrison. Computer graphics, Georges Mauro. Sonic architecture and programming, Dorota Blaszczak. The artist becomes a creator and manager in a work of this magnitude, which takes several individuals with diverse specialties to be able to present it. This type of art experience literally envelops the viewer (now a participant) in a unique visceral encounter. After several minutes within the work, the color and sound fade in one of several endings in which naturalist hues—neutrals of either autumn leaves, embers, or ashes—float in an empty space. None of us can quite know the future of color. It will change and evolve as technology and science continue to move forward. But it is certain to say that advances will continue. Whether it is finding new uses for materials as Gehry did in the Guggenheim at Bilbao, or exploring the realms of new technology, color never stands still. 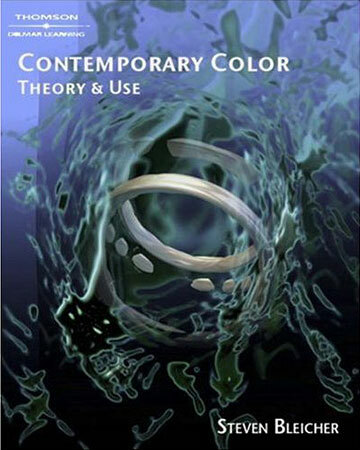 But it is not only technology that will shape the future of color. Low-tech inventions have helped refine the existing art media and have made them safer to work with and use. This may open up art to new experiments from hobbyists to pro­fessionals. Legal issues will also continue to shape graphic design and advertising. Since there is only a finite number of hues, the rush to claim their providence will continue and may become more contentious. As we have seen throughout the text, color may be one of the single most important design elements. Its future is now in your hands. Where will you take it? How will you use it? What new forms will you be able to create?